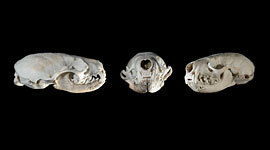 The carnivorous details of a perfectly preserved mink skull, found in the Sans Souci region of Georgian Bay. 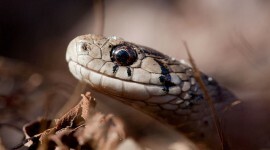 An unlikely mating of a Canon EF-S 60mm f/2.8 macro lens to a full-frame Canon EOS 5DmkII (you’re not supposed to be able to use short-backfocus lenses on full-frame bodies) picks out a Dekay’s Brown snake amongst the dull browns of early spring. 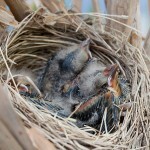 Blackbird chicks, their eyes finally open, await their next feeding. 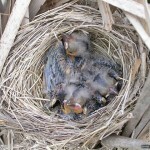 Three blackbird chicks, eyes not yet fully open, rest in their nest. 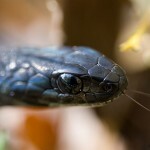 A melanistic garter takes a sniff of the fresh springtime air. One of Cathy’s daisy-like flowers opens up in the brief daylight of November. 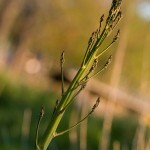 Wild asparagus prepares to go to flower near the breakwall by Bayview Avenue. This monster was wonderful to watch grow, it reached six feet tall before storm winds blew it over causing irreparable damage. 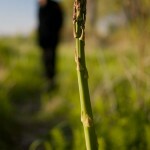 The wild asparagus of Bayview Ave., here now almost three feet tall. Who knew they’d grow to be so big? 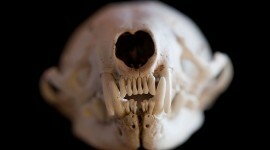 The carnivorous teeth of a mink skull discovered in the Sans Souci area of Georgian Bay.